Congratulations to Charlotte and Emma Barker for winning our Flyer Competition! Competition was fierce but we loved the use of colour and wording on this flyer. Flyers will be hitting venues in the next week, so look out for your design around Sale Town Centre! We’re celebrating 10 years at the Waterside on Saturday 28th April! We’ve had a few homes over the years and absolutely love being at the Waterside. From humble beginnings the audience has steadily grown and the show now has regular fans some of whom we’ve watched grow up whilst some weren’t even born when we moved the show to Sale! We’d incredibly thankful for the support of the venue, it’s fantastic staff and the audiences and volunteers that have given us such brilliant suggestions! To celebrate 10 years at Waterside we’ll be having an Oldies vs Newbies special as players that have been with us since we started at Sale take on the new bloods! As always there will be a referee on hand to ensure a good clean match, get suggestions and keep the action flowing. Because of the continued support of our audiences we’ve been able to launch two brand new shows at the Waterside in the last 12 months. The first, ComedySportz 4 Tots has plenty of big laughs for little kids with silly story, songs and games as well as plenty of interactivity for young ones. The show has proven to be very popular, introducing kids under 6 to comedy and performance. We then launched our Improvised Pantomime in December 2017 which proved yet again to be incredibly popular. We’re delighted to have earned the audience’s trust to try new shows and formats and your support has been fantastic. We’ve made some fantastic memories at the Waterside and we’ll be sharing those here and on our twitter and facebook pages throughout the week. Sally gets a brown bag. She still protests her innocence. Also, if you want a weekend of Improv be sure to check out our friends at Bumper Blyton Improvised Adventure on Friday 27th at Waterside – featuring ComedySportz alum Sally Hodgkiss. It’s a fantastic show and we’re very much looking forward to it. Sally was a third of the audience at our very first show at the Waterside – how times have changed! Buy ComedySportz 4 Tots tickets here. 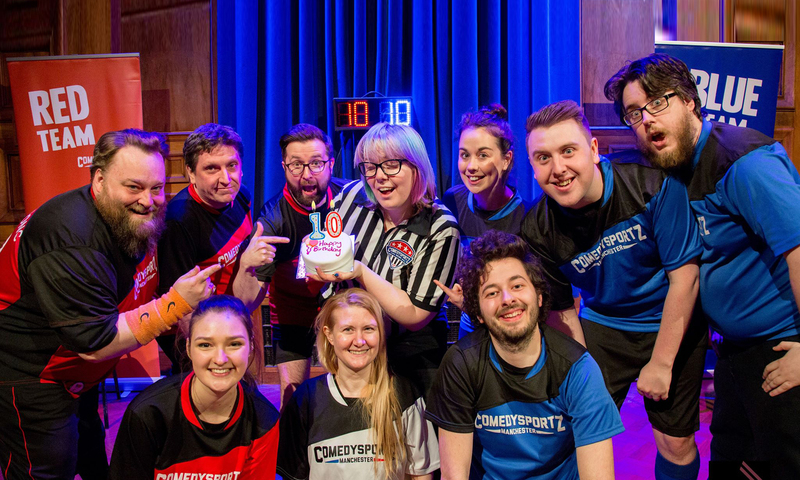 Buy ComedySportz 10 Anniversary tickets here. We are looking forward to a fab time today at Bury Pride! Show at 3.30pm in the Elizabethan Suite, Lancaster Room.